Interbay's outstanding teaching staff proudly presents a new season of junior camps. Our certified PGA and LPGA teaching professionals create a fun and exciting environment where kids can learn, practice, and play. Practice balls, on course play (older kids camp) and some snacks are included in the price. Upon completion of the camp, each student will receive a certificate of achievement and a practice card entitling each camper to four buckets of balls and a round of golf ($35 value). To register, please click on the links below. *Online registration ends the Wednesday the week before camp starts. Call for last minute availability (206) 838-4549. Kids learn basic swing and short game fundamentals through drills, games and skills challenge/play. The focus is developing skills. This is a great camp for juniors to hone their skills and ready them for play on the course. The 5 day camps include the 3 day SKILLS camp curriculum. The last 2 days of camp are spent mainly on the course. The emphasis is on games, play, rules, etiquette, and sportsmanship. These camps are designed for the young golfers. Students are taught full swing and short game fundamentals. Kids are introduced to the game's rules, etiquette, and playing. *Online registration ends the Thursday before camp starts. Call for last minute availability (206) 838-4549. Campers can either purchase lunch at the café or bring their lunch. Camps include instruction, range balls, and mini-golf. Campers should dress appropriately and wear sunscreen as needed. Thank you! - Opportunity for advancement to post-season all-stars! - Advanced skills not required, but a set of clubs is. 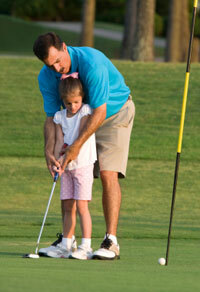 - If your child can drive, chip or putt... we have a role for them! To register for Interbay's PGA Jr. League Golf, please click here!